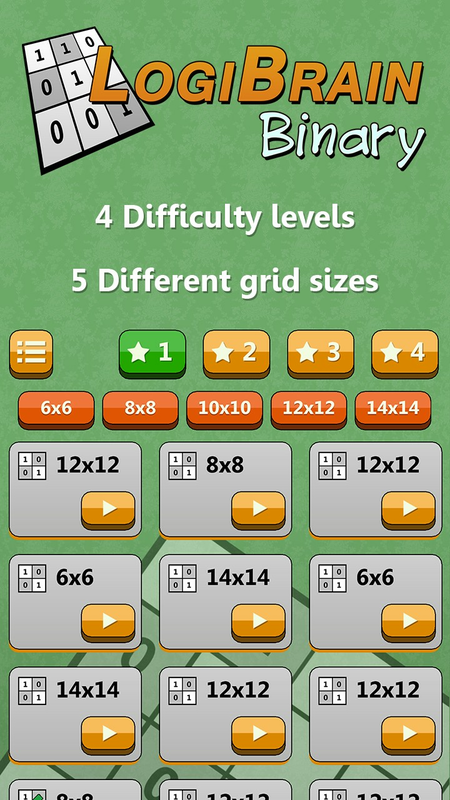 4 difficulty levels, 5 different sizes .... hundreds of unique grids to play. 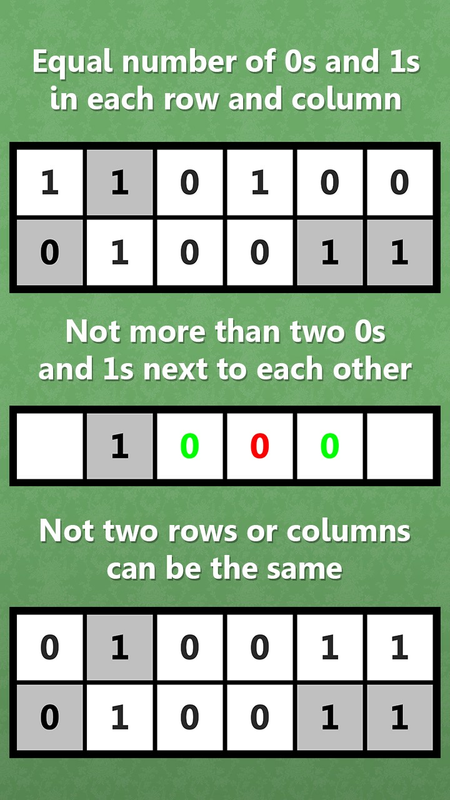 LogiBrain Binary is a new challenging logic puzzle game. 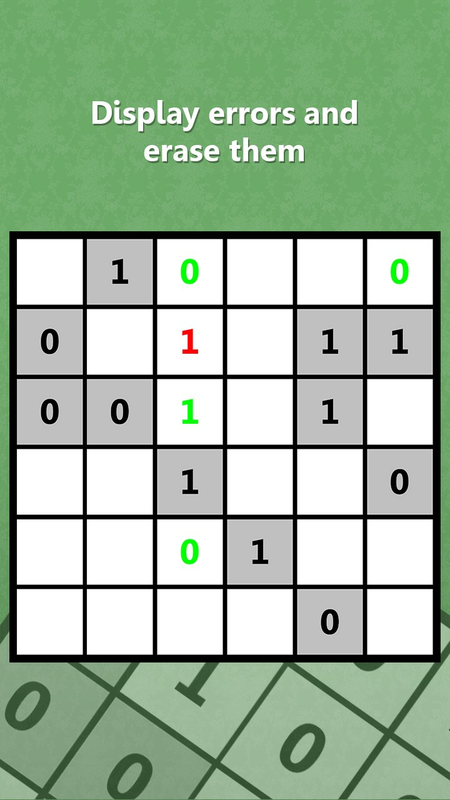 Although the binary puzzle consists only of zeros and ones, solving is certainly not easy. LogiBrain Binary seems simple, but it is yet addictive! We can guarantee you hours of fun and logic. 1. Each box should contain a "1" or a "0". 2. No more than two similar numbers next to each other in a row. 3. Each row should contain an equal number of zeros and ones (14x14 grids at each row/column 7 ones and 7 zeros). 4. Each row and each column is unique (No two rows and columns are exactly the same). Each binary puzzle has only one correct solution, this solution can always be found without gambling! The first click on the empty field sets the field to "0", a second click to "1", a third click empties the field. Simple rules but hours of puzzle fun. Because no more than two of the same digits may be next to or placed under each other, duos can be complemented by the other digit. If two cells contain the same figure with an empty cell in between, this empty cell can be filled in with the other digit. Each row and each column has the same number of zeroes and ones. If the maximum number of zeroes has been reached in a row or column it can be filled in a one in the other cells, and vice versa. Make sure that certain combinations may or may not be possible in rows or columns. If you like LogiBrain Binary, please take the time to give us a nice review. This helps us to make the app even better, thanks in advance! The puzzles in LogiBrain Binary are also known as Takuzu, Binaro, Binero, Binairo, Binary Puzzle, Tohu wa Vohu, Tohuwabohu, Bento or Binary Sudoku.